On Feb. 4, the Market to MOHAI project secured an $85,000 grant from the Seattle Department of Neighborhoods’ Matching Fund. The grant will help pay for a safe, engaging, well-lit and well-marked path from Pike Place Market to the Museum of History and Industry (MOHAI) in South Lake Union. The funding supplements $170,500 raised privately. Once built, the corridor will link four Seattle parks with improvements that bolster safety and comfort, especially for seniors and those with disabilities. New features will include 75 blue sidewalk tiles and 55 seven-foot-high “history blades.” The tiles will contain cultural messages and quotes relating to the project’s theme: “See the city through new eyes.” Their color, content and arrangement will help travelers walk confidently through neighborhoods along the route. Stories and photos attached to light posts will narrate the path’s history, offering moments to reflect on the city’s growth and change. Market to MOHAI will hold a series of outreach events through summer 2019, and a “Claim the Corridor” celebration of initial installations in late fall. Remaining elements will be completed in 2021. The public is encouraged to offer comments and feedback. The Market to MOHAI coalition includes DSA and the city of Seattle. 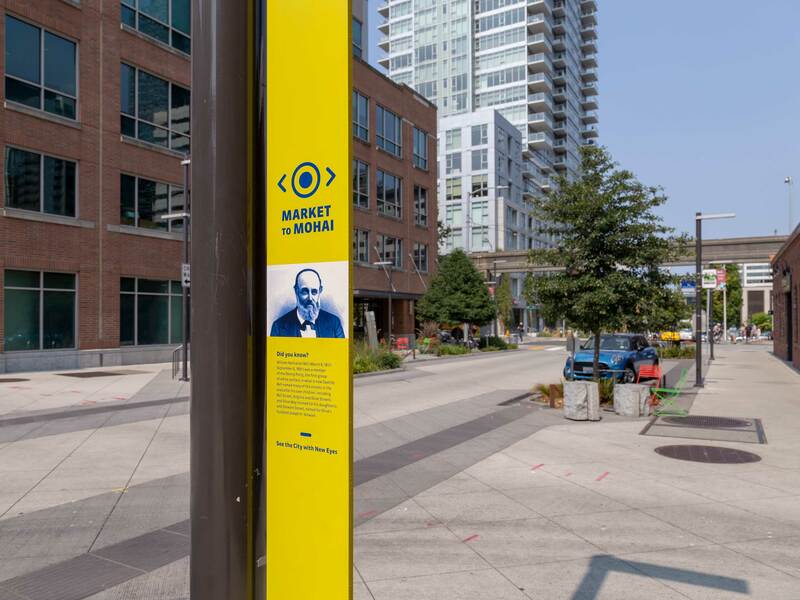 It was formed to build an identity and pedestrian strategy along the 18-block route from South Lake Union to Pike Place Market.